Browse our collection free, downloadable and customizable tools and templates to help you organize and streamline the grant writing process. Templates can make grant writing and managing a proposal team a little easier. Use the templates as-is or modify to serve your needs. A style sheet is a reference guide that covers everything from formatting standards to punctuation preferences to ensure consistency within and across documents. To be useful, a style sheet should reflect only the most important things. It is not meant to be a comprehensive guide (for that you'll need to turn to something like The Chicago Manual of Style). You may want your style sheet to capture spelling preferences (e.g. “e-mail” or “email”); use of capitalization; style choices such as bold, underline, and italics; and preferred phrases and terminology (e.g. referring to individuals served as “clients” instead of “patients”). You can also reserve the style guide for noting any proposal formatting requirements required by the funder and rely on your organization's style guide as your main style reference. This 3-page style sheet includes room to note application formatting requirements; common grammar and spelling issues; and style choices such as preferred punctuation or how citations should be handled. The form is an editable PDF. For more information on how to use a style sheet as part of the grant process see the post "Creating a Style Sheet for Grant Proposals" at www.peakproposals.com. This one-page document is a checklist of suggested topics to cover during the initial team meeting at the beginning of the proposal process. This first meeting after a decision to go for an opportunity is often referred to as the "kick-off" meeting or mobilization meeting and may include participants from outside organizations in addition to internal team members. For more information about the kick-off meeting read this post on the Peak Proposals blog. Grant writing requires a team. Keep the names of the team members and their contact information on hand and easily accessible with this editable PDF form. The form includes five columns (name, organizations, role, email, phone) and room at the top to capture essential information including opportunity name, tracking number, and application due date. Use this foundation tracker to make a quick note of which foundations deserve a further look and which can be eliminated from further review. The foundation tracker is meant to be used in the first stage of the prospect research process. For more information about using prospect research to identify potential funders, see the post "Getting Started with Prospect Research" on the blog. The foundation tracker is a 5-page, editable PDF. As part of the prospect research process, after you've completed an initial, quick pass of foundations of interest to you, a few foundations will be worth analyzing in greater depth. 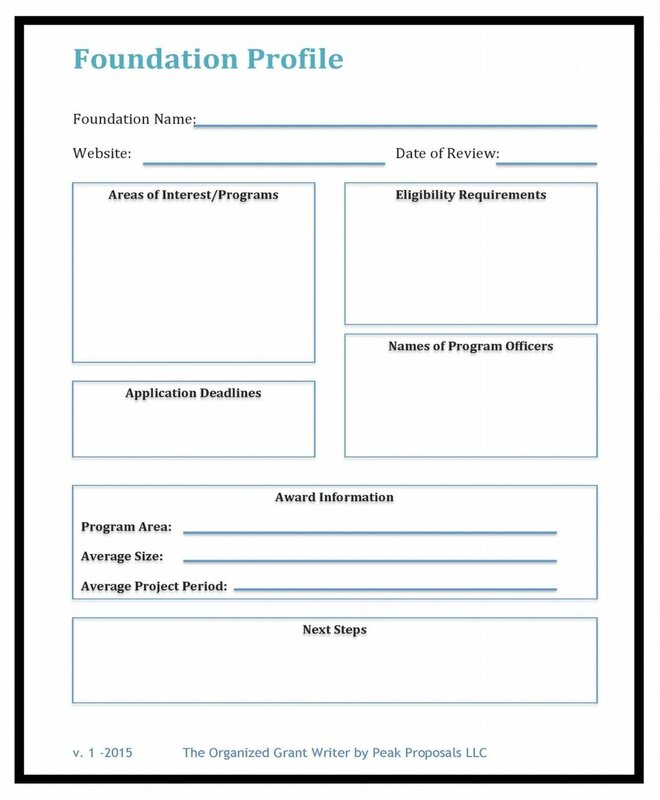 Use the foundation profile template to collect basic information about a foundation for later reference. Included in the form are sections for capturing foundation staff, program areas of interest, and average award size. This form is an editable PDF. For more information on using prospect research and using the foundation profile form see the blog post "Getting Started with Prospect Research." As part of the prospect research process, once you identify a specific funding opportunity of interest you'll want to summarize the details. With the details in hand, you can have an informed discussion with your colleagues regarding whether to pursue an opportunity. This two-page opportunity summary template will help you capture the basics from the name of the funder to the opportunity's goals, objectives, and result areas. This form is an editable PDF. For more information on how to use the Opportunity Summary sheet please see the blog post "Moving from Research to Proposal Preparation." Grant amounts, project periods, report dates...it can be hard to keep them straight! Even if you use an online database, sometimes it's helpful to have a list of your current grants printed out and tucked in your notebook or posted on your bulletin board for easy reference. Here's a free download to keep the information you need to know close at hand. Keep track of the skills and experiences your team offers with this customizable staff matrix. Particularly if you are applying to a government grant, you are going to need a skills tracker like this to record the names of the staff members who will be bid on a project along with their educational background and management and technical skills. The matrix has a place to note organizational affiliation if you are partnering with other organizations and institutions to develop the proposal. The editable PDF includes 2 pages with space to type in team member names, roles, organizational affiliation, and educational background. The first page has space to write down key information about the opportunity including name, identifying number, and application due date. Before you submit your proposal, it’s always good to do a final check to make sure the formatting is correct and the proposal package has all of the required materials. 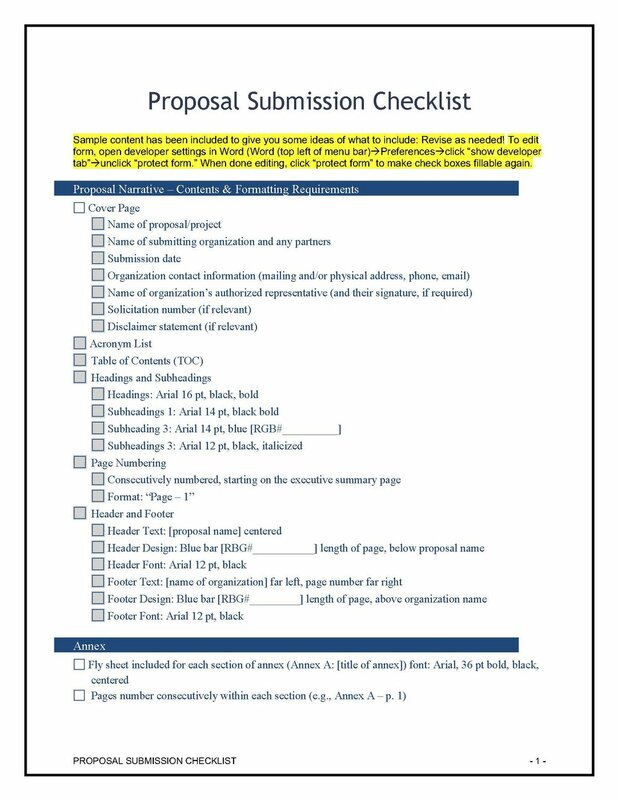 A submission checklist is also useful for summarizing submission instructions, so you make sure to send the proposal according to the funder’s guidelines. This downloadable, editable checklist can be customized to meet your needs. Note: If you would prefer to download a non-fillable PDF version, please click the image below. Since the PDF version cannot be edited, you can use it as a reference to create your own template. If you prefer to edit our form rather than creating your own, you’ll need to use Adobe Pro to convert the checklist from a PDF into a Word document. For reference when you are writing or editing grant proposals, we’ve created a downloadable PDF that includes common abbreviations we’ve encountered in recent proposals. We’ll continue to add to the list, so check back periodically for the latest version. In addition to this list, if you work in international development, you might also find it helpful to refer to the abbreviation list compiled by USAID alumni and found on the website usaidalumni.org.